Every time I download subtitles for a movie or a series episode, I cannot help thinking about all this text that could be analyzed with text mining methods. As my PhD came to its end in April and I started a postdoc in September, I could use some time of my looong summer break to work on a new R package, subtools which aims to provide a toolbox to read, manipulate and write subtitles files in R.
In this post I will present briefly the functions of subtools. For more details you can check the documentation. The package is available on GitHub. The subtools package stores imported subtitles as simple S3 objects of class Subtitles. They are lists with two main components : subtitles (IDs, timecodes and texts) and optional meta-data. Multiple Subtitles objects can be stored as a list of class MultiSubtitles. The subtools package provides functions to easily manipulate Subtitles and MultiSubtitles objects. convert subtitles and meta-data to a virtual corpus with tmCorpus if you want to work with the standard text mining framework tm. convert subtitles and meta-data to a data.frame with subDataFrame. If you want to use tidy data principles with tidytext and dplyr, you should probably start here. Because the subtitles are correctly organized in directories, we import them in one command line using the function read.subtitles.serie. The nice thing is that this function will try to automatically extract basic meta-data (like series title, season number and episode number) from directories/files name. a is a MultiSubtitles object with 60 Subtitles elements (episodes). We can convert it directly to a tm corpus using tmCorpus. Note that meta-data are preserved. And finally plot the cloud! 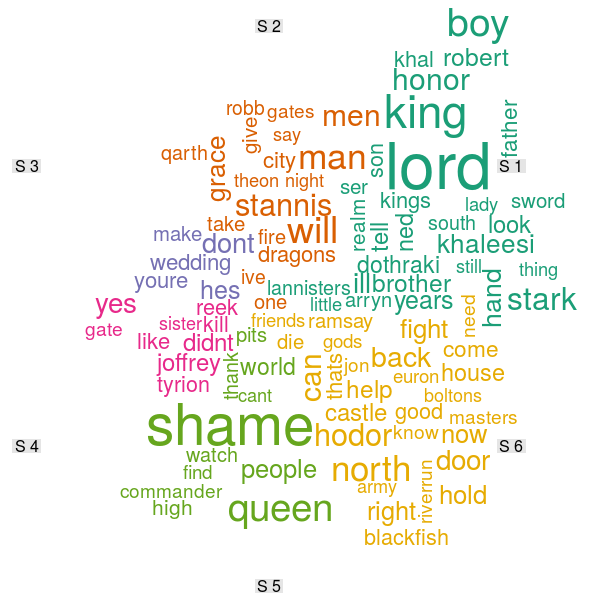 Subtitles wordcloud of the six seasons of Game of Thrones. Few words about this plot. Like every wordcloud, I think it’s a very simple and limited descriptive way to represent the information. However, I like it. The people who have watched the TV show will look at it and say « Oh of course! ». In one hundred word, the cloud is not revealing the scenario of GoT, but for each season I can see one or two critical events popping out (wedding, kill/joffrey, queen/shame, hodor/hold/door). What I find funny here (perhaps interesting? ), is that these very important and emotional moments are supported in the dialogs by the repetition of one or two keywords. I don’t know if this is exclusive to GoT, or if it’s a trick of my mind, or something else. And I will not make any hypothesis, I’m not a linguist. But this is the first idea which came to my mind and I wanted to write it down. Is there any way to see which character speaks which line? Unfortunately, not really. A subtitles file is not a script. There are some extended formats like WebVTT which allow to record who is speaking but this is not implemented in subtools and this kind of data may be hard to find.